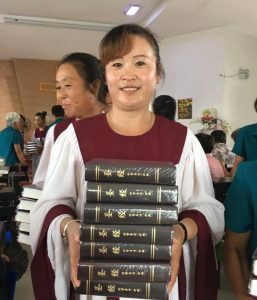 China (MNN) –Bibles for China is seeing increasing challenges for the Church in China as the Chinese government enforces stricter religious regulations. The world is a hostile place for the Christian faith. The Bible warns Christians of this truth in Matthew 10:22. Matthew 10:22 says, “You will be hated by everyone because of me, but the one who stands firm to the end will be saved.” (NIV) A tangible example of this is the Open Doors World Watch List*, which ranks the top 50 countries (out of 196) where life is hardest as a Christian. China is currently ranked 27, but the situation is rapidly ramping up. The Chinese government is using religious restrictions to crack down on the Chinese Church and change the Bible. The Guardian reported in January 2019 that the government was trying to “sinicize” the Bible. In other words, they are trying to make the Bible match up to Chinese ideology by changing God’s Word. In China, and in other places around the world, maintaining the truth and integrity of the Bible is becoming more difficult. Wendall Rovenstine, president of Bibles for China, says, “In any country where there is spiritual disruption, basically there are two things happening… they are rejecting Jesus Christ and they are rejecting God’s Word.” He adds, “Bibles for China really has a heart for [asking] how can we maintain the crispness of God’s Word? We want to make sure the Bibles we provide in China [have content that] is pure and clean.” As this question gets harder to answer, the Church in China faces more difficulties. For the Church in China, being a member of the registered church means going on record as a Christian. “When you go to a registered church… your name goes on record that you are a Christian. Those people really have a lot of spiritual stamina that they are willing to put their name on record…The religious freedom that exists over there is nonexistent,” Rovenstine says. A registered church, in comparison to an unregistered church, is one that has agreed to follow government regulations in return for legal permission to meet and organize events. Even though the government is increasingly diminishing religious freedom and shutting down churches, this is a risk Christians are willing to take. Bibles for China is dedicated to providing unchanged Bibles to rural China. 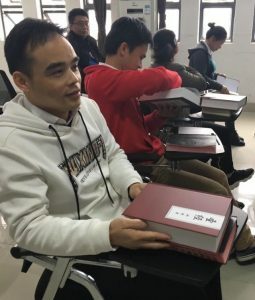 Using an in-country printing press called Amity Press, located in Nanjing, China, they can legally provide Bibles to registered churches in rural China. Chinese Christians living in rural China often don’t have access to Bibles and don’t have the resources to purchase one for themselves. Bibles for China is stepping in to help provide Bibles to these churches and work with local pastors. Rovenstine says, “The pastors that we’ve had relationships [with] over the years… [are] quality pastors that preach the Gospel, love His Word, and are willing to sow God’s Word.” Do you want to help provide unchanged Bibles to the Chinese Church? Click here to donate funds to Bibles for China. Second, pray for the Church in China. Pray that they may have access to the unchanged Word of God. Pray that God’s Word remains untampered with and respected, even as these challenges increase. “Pray… for Bibles to be released in China and Bibles that maintain good content that stands for God’s Word,” Rovenstine says. *Open Doors USA’s World Watch List is a ranking of the most severe countries for Christians to live. Find the USA World Watch List here. Header photo courtesy of Bibles for China via Facebook.